Electronics and appliances commonly use around two thirds of a home’s electricity. Knowing where that electricity is being used is an important step in reducing electricity usage. 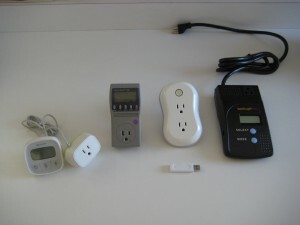 There are several low cost alternatives that can tell you the power consumed by anything that you plug in to an outlet. The original home meter is the Kill A Watt EZ, which can be purchased for under $30. It displays the current watts used (all you need for items that have a constant draw) as well as cumulative power used (good for items that have varying draw, like refrigerators). It can be set up to compute the cost of the power, too. The Belkin Conserve Insight energy use monitor has similar features and cost. Its display is separate from the plug, making it handier when the outlet is hard to see. The Watts Up Pro costs over $100, but records measurements and includes a USB interface to download the data to a computer. The data can be useful for appliances that have highly variable power levels that you may want to adjust. A new product that includes power switching as well as measurement is the ThinkEco Modlet. It costs about $50 per outlet, and includes a wireless link to your computer. From any computer you can log into their website and see plots of power consumed by each outlet. You can also turn outlets on and off, and put them on schedules (as long as the base computer is on). Once you start taking power measurements you can find your energy vampires and hogs, and then save energy by putting them on switchable power strips, replacing them, or using other strategies.